Barbiturates are drugs that can be used for a wide range of reasons. These drugs are known to depress the central nervous system and are therefore utilized for surgery as well as for sedation or as anticonvulsants. They can be used to treat insomnia, anxiety or seizure activity, for euthanasia purposes or during executions. They also have been used recreationally. methohexital (Brevital®) - A barbiturate derivative, methohexital is most often used to induce sedation for surgery. It can be used for general anesthesia or for "twilight sleep." Nausea, vomiting, dizziness or shivering can occur after injection. thiamylal (Surital®) - A barbiturate derivative, thiamylal is also used for general anesthesia for surgery. Typical side effects are drowsiness and dizziness. thiopental (Pentothal®) - A core medicine in the World Health Organization's "Essential Drugs List," thiopental is used to induce sedation for surgery. 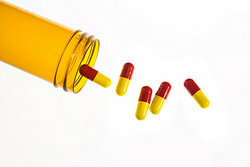 Headache and nausea are the most common side effects from this drug. amobarbital (Amytal®) - A hypnotic, amobarbital is prescribed for a very short term treatment for insomnia. However, after two weeks, its effectiveness is lost. It is administered via injection. Amobarbital can cause various side effects including confusion, nervousness, hallucinations, anxiety, depression of the central nervous system and agitation. Its use can also result in hypoventilation, bradycardia, constipation, nausea and vomiting, fever, liver damage and headaches. pentobarbital (Nembutal®) - Used as a sedative or anticonvulsant, pentobarbital can be administered via capsules, liquid, injection or suppositories. As with other barbiturates, effectiveness is drastically reduced or eliminated after two weeks of usage. Usage of pentobarbital can result in side effects such as hallucinations, insomnia, anxiety, agitation, drowsiness, nightmares, and abnormal thinking. Patients can also experience nausea, vomiting or constipation, joint pain, rash, bronchospasm and respiratory depression. With intravenous usage, hypotension, bradycardia and syncope have been reported. secobarbital (Seconal®) - Lowering the level of activity in the brain, secobarbital is most commonly used on a short term basis to treat insomnia or to reduce anxiety prior to surgery. This drug is administered in capsule form. Memory and concentration problems as well as drowsiness and dizziness are the most common side effects associated with secobarbital. Excitement, constipation and nausea have also been reported. Seconal sodium can also reduce the effectiveness of birth control pills. butalbital (Fiorina®) - Butalbital is often combined with acetaminophen, codeine, or aspirin to help alleviate headaches. Dizziness, euphoria, nausea, memory loss, constipation and lightheadedness are side effects of this drug. butabarbital (Butisol®) - Used as a sedative or narcotic, butabarbital is administered via a tablet in dosages of 30 mg or 50 mg. Like amobarbital, effectiveness is also lost after about two weeks of usage. Side effects can include mood alteration, mild sedation, excitation, decreased motor functions, drowsiness, sedation and deep coma. An overdose can result in death. Behaviors such as sleep-driving, driving while not truly awake after ingestion of the medicine with no memory of the event, have been reported by some who have taken this drug. phenobarbital (Luminal®) - Intended to control abnormal electrical activity in the brain, phenobarbital is an anticonvulsant prescribed to reduce seizure activity. Drowsiness and dizziness are common side effects of phenobarbital. Additionally, headaches, loss of appetite, nausea, excitation, and vomiting have been reported. Some patients have reported increases in feelings of depression and thoughts of suicide. If an individual abruptly stops using phenobarbital, side effects and withdrawal symptoms can include hallucinations, anxiety, twitching and sleep disturbance. mephobarbital (Mebaral®) - Used for the treatment of anxiety and prevention of seizures, mephobarbital causes mild sedation. Nervousness, memory problems, headaches, and dizziness have been reported by patients taking this medication. All barbiturates have a high risk of inducing dependency. "Examples of a Barbiturate." YourDictionary, n.d. Web. 23 April 2019. <https://examples.yourdictionary.com/examples-of-a-barbiturate.html>.